Bell is a retired President, Executive Vice President and Chief Financial Officer of The Boeing Company. He served as interim President and Chief Executive Officer of the Boeing Company on March, 2005, following the resignation of Harry Stonecipher. He returned to his singular role as Boeing's CFO on June 30, 2005 following the appointment of Jim McNerney as the new President, Chairman, and Chief Executive Officer of the Boeing Company. He was appointed Corporate President in June 2008. On June 14, 1948, Bell was born in Los Angeles, California. Bell was the youngest of four children. Bell's mother Mamie was a former Los Angeles County government clerk. His father died in 2003. In 1997, Bell earned his bachelor's degree in Accounting from California State University, Los Angeles. A partial scholarship helped pay for his first year of college, but he had to earn enough to pay his way through the remainder of school. Within Boeing, he has held positions as vice president of contracts and pricing for the company's Space and Communications Division. He later became senior vice president of finance and corporate controller. In November 2004 he became the company's Chief Financial Officer, following the firing of Michael M. Sears due to a government contract scandal. 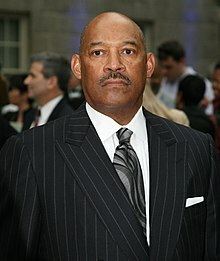 He is a member of the board of directors of J. P. Morgan Chase, Dow Chemical Company, the Chicago Urban League, World Business Chicago, the Chicago Economic Club, New Leaders for New Schools and Apple Inc.
^ "calstatela.edu James A. Bell '97,". Retrieved Nov 29, 2016. ^ "James Bell Joins Apple's Board of Directors". Apple. October 1, 2015. ^ 32nd Alumni Awards Gala (2004) "alumni.calstatela.edu, 2004 James A. Bell '97". Retrieved Nov 29, 2016. ^ 32nd Alumni Awards Gala (2004) Biography "alumni.calstatela.edu, James A. Bell '97". Retrieved Nov 29, 2016.